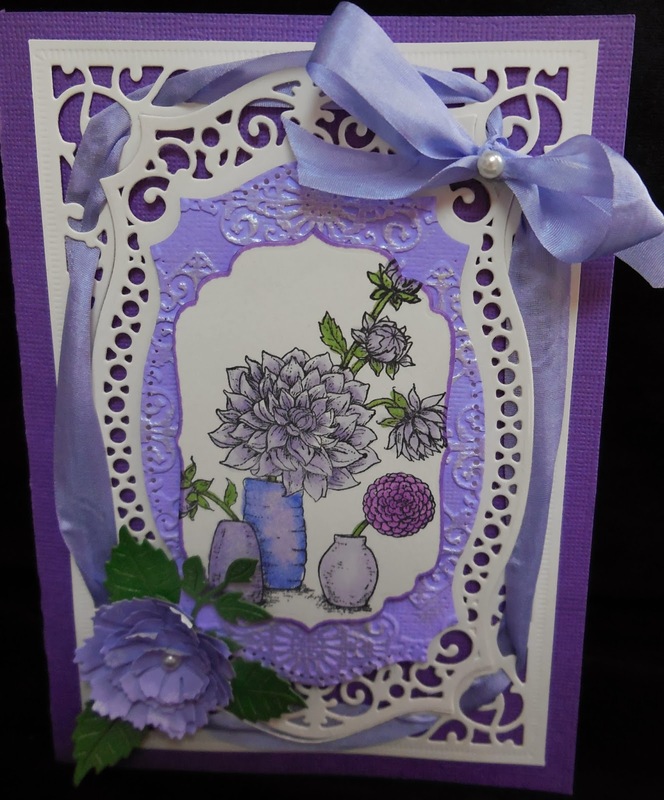 I made this delicious purple card for the Pantone Challenge at Flourishes this week. I started with a 5x7 card and used the pretty Spellbinders Majestic Labels 25 with a labels 4 for the image. I threaded some light purple ribbon through the die and tied the bow. The Leaves, leaf flourish and flower are all Cheery Lynn dies. I colored the Dahlia image with copics in BV collection. Oh Karen! It's wonderful! Love all the layered die cuts and your colouring is great! Thanks for joining our "Timeless Tuesday Challenge" over at Flourishes! I'm a stay at home wife, mother and rubber stamping fanatic. As a former hairdresser, medical secretary and Chamber of commerce secretary I am enjoying staying home and creating cards now.